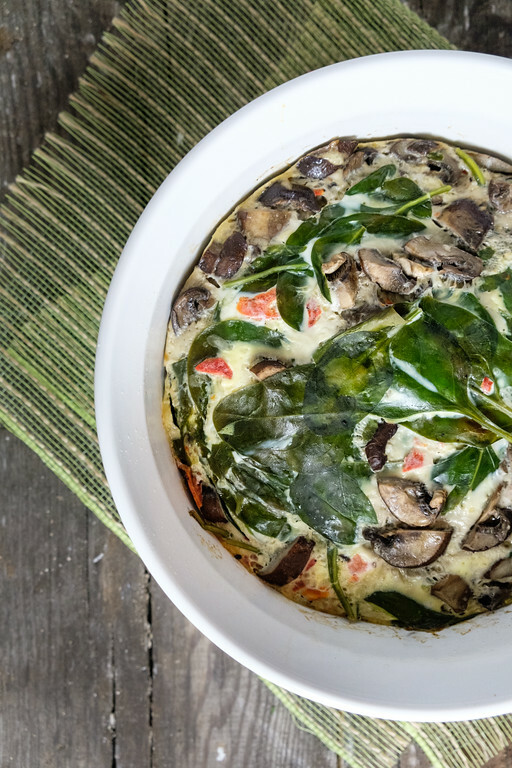 You are going to love how easy it is to make frittatas in the Instant Pot, like this Instant Pot Frittata with Spinach and Mushrooms. Post contains affiliate links. At first, I wasn’t going to post this Instant Pot Frittata with Spinach and Mushrooms, because I wasn’t super happy with the photo. I should have gotten one of it sliced and from the side so you could see the texture. But this frittata was so good, I didn’t want to have to wait to share until I took better photos! Click here to pin this Instant Pot Frittata with Spinach and Mushrooms. I love frittatas. They are one of my goto “clean out the fridge” easy weeknight dinner. So, I wanted to find out if a frittata would work in the Instant Pot. I found this recipe in The Essential Instant Pot Cookbook and it sounded like a good one to try. I love the spinach mushroom combination. The Instant Pot is great for making frittatas! Not only did it work, but we loved it! It was perfectly cooked with a nice texture. I did note that the ingredients rose to the top, whereas when I make a frittata on the stove, the ingredients tend to sink to the bottom. I was afraid that I would miss the browned bottom part of the frittata, but I didn’t miss it at all – and the ease of using the Instant Pot more than made up for it. I plan on redoing some of my favorite frittatas: Sweet Potato and Baby Spinach Frittata and Swiss Chard Frittata for the Instant Pot. If you’re looking for another meatless Instant Pot Recipe – try this Mushroom Barley Risotto – so good! This Instant Pot Frittata with Spinach and Mushrooms is an easy meatless meal with lots of flavor! Using butter or non-stick spray lightly coat a 7-cup heatproof glass container. Create a sling from aluminum foil by folding a 20 inch long piece in half lengthwise twice. Center the glass container on the sling. Pour 2 cups of water into the Instant Pot and set the trivet inside. In a large bowl, whisk together the eggs, milk, salt and pepper. Then stir in the spinach, mushrooms, garlic, tomatoes and cheese. Pour the mixture into the glass container and cover tightly with foil. Using the foil sling that you created, lift the container and place it in the pressure cooker on top of the trivet. Fold over the edges of the sling. Secure the lid and set the vent knob to sealing. Using the manual setting set the time to 25 minutes at high pressure. When the machine beeps, let the pressure release naturally for 10 minutes and then do a quick pressure release by moving the vent knob to venting. Open the pot, and remove the container using the sling that you created and heat proof mitts. Carefully uncover the foil, it will be steamy. Cut into wedges and sprinkle with parsley to serve. 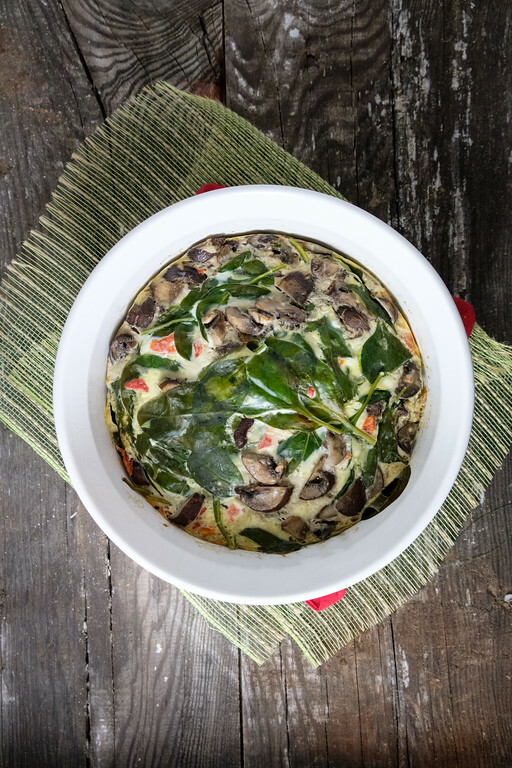 Your Instant Pot Frittata with Spinach and Mushrooms is fantastic, I can’t wait to try it! Thanks so much for sharing your awesome post with us at Full Plate Thursday. Have a great week and come back soon! Thanks so much for the support when Mr Buttons had to go over the Bridge. It was very sudden and he was a big part of our family. We miss him terribly. He’ll have to let me know when he tries something. I am sorry about Mr. Buttons, we never get over it. I’m trawling through your summer recipes for inspiration and bookmarking these winter recipes in anticipation of coo;er, n o colder, days to come. One of my favorite foods. You can have this for breakfast, lunch or dinner.